L. Parker Stephenson Photographs is pleased to announce its second exhibition of photographs by John Cohen and the first ever of his color work in the country. Between 1959 and 1970 Cohen, himself an active participant in the music scene, captured fellow legends Bob Dylan and Woody Guthrie, “two titans of American music at the opposite ends of their careers”*. This exhibition of color and black and white prints coincides with both the release of Dylan’s new album “Another Self Portrait 1969-1971” and Guthrie’s centennial. 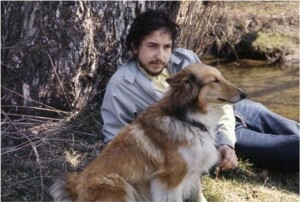 In 1970, John Cohen made photographs of a young Bob Dylan in New York City near Dylan’s home in Greenwich Village and in Putnam Valley around Cohen’s farmhouse. Ektachrome slides of these photo sessions were recently unearthed during the selection of unreleased recordings and demos from the period for Dylan’s new Bootleg Series album. From these, limited edition prints have been made and are now available for the first time. The deluxe version of Dylan’s “Another Self Portrait” album, scheduled for release on August 27th, includes a book with over 60 of Cohen’s photographs from these early shoots. A decade earlier, in the late 1950s and early 1960s, a revival of folk music was taking place and Woody Guthrie, American folk music’s most influential figure, was making his last appearances. Cohen spent time with Guthrie during this period and made intimate photographs of the music icon. Guthrie, who would have been 101 this year, was an inspiration for countless young musicians (among them Dylan) and, for some, his song “This Land Was Made For You and Me” has practically become a national anthem. The Woody Guthrie Center in Tulsa, Oklahoma, opened earlier this year with an exhibition of Cohen’s photographs. In addition to being a photographer and filmmaker, John Cohen is also a musician who for fifty years performed and recorded with the New Lost City Ramblers, one of the folk revival’s most authentic and respected groups. His archive resides at the Library of Congress and his photographs are in the permanent collections of The Metropolitan Museum of Art, NY; The Museum of Modern Art, NY; New York Public Library; Philadelphia Museum of Art; National Gallery of Art, DC; National Portrait Gallery, DC; Brooklyn Museum, NY; Yale University Art Gallery, CT and the Victoria and Albert Museum in London as well as many important private collections. A book titled, Here and Gone, covering Cohen’s photographs of Guthrie, Dylan and more of the 1960s music scene will be published by Steidl in 2014. Cohen’s new color works of Bob Dylan will also be shown in Los Angeles at The Morrison Hotel Gallery (September 6 – September 22). Prints are available for sale at L. Parker Stephenson Photographs in New York and Morrison Hotel Gallery in Los Angeles. *Robert Santelli, Executive Director of The Grammy Museum, describing the current and inaugural exhibition of Cohen’s work at the Woody Guthrie Center in Tulsa, OK.
L. Parker Stephenson Photographs, located at 764 Madison Avenue between 65th and 66th streets, is open Wednesday – Saturday from 11am-6pm.